"I was alright until the final whistle and I went on the pitch. The last 10 days or so, I can't begin to explain to you how difficult it's been. Knowing Emiliano as I did, I knew that he would have been with us today. "I thought the whole club was amazing... I think I was the proudest man to be the manager of the whole club today because the fans were just amazing. "I started clapping [after the game] and the volume got higher and higher. I've never seen anything like it. I've never heard anything like today ever and I'll remember it for the rest of my life. "I felt immensely proud and I had pride in everybody. It was as if we had to show everybody our support for him. Coming back to the main stand to see my wife and kids up there, it just hit home that we had done him proud today. "If we didn't get another point this year, I think they [the squad] have been amazing. I couldn't ask any more of any of them. We had all the ingredients today and it was almost like we couldn't be beaten today with the crowd. It was fabulous stood on the touchline." "I think we deserved it. We knew that Bournemouth would have a lot of the possession, we worked on certain aspects of the game and I thought we were always a threat on the break. "We could have had more goals and I was delighted to get the three points because it makes a few of the other clubs a bit more nervous over the next few weeks. "The whole squad have really worked hard. 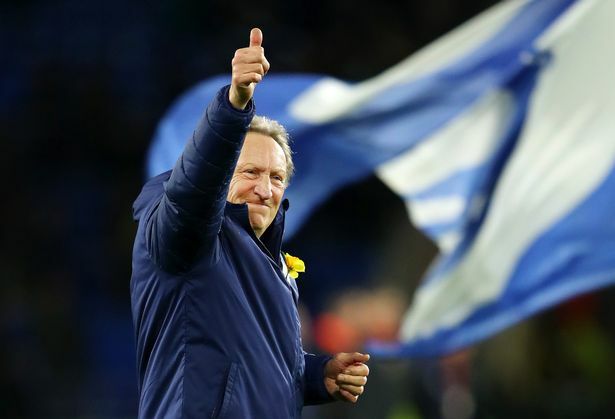 We haven't even got Harry Arter and Victor Camarasa today and we made up for it... We were quite positive in how we set up and it was just great to get the win. I didn't see either goal so I will have to keep away a little bit more."